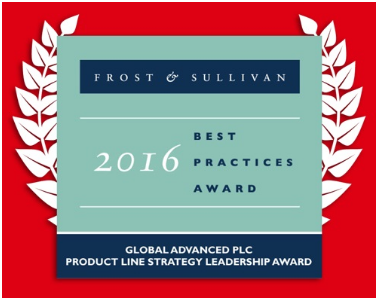 Frost & Sullivan’s Product Line Strategy Leadership Award!! We are truly proud to announce that Frost & Sullivan, a major market research and analysis firm, has honored Unitronic's with the Best Practices Awards for 2016. The prestigious award for Global Advanced PLC Product Line Strategy Leadership was given after Frost & Sullivan conducted an in-depth review of Unitronics products, specifically our 3 major product series--Samba, Vision, and UniStream--in relation to the dynamic, competitive market that challenges PLC manufacturers. Next entry Cool Application Story!! !